this week's Fashion Friday is allow about bright, playful, summer-y fun. mint/aqua has the best summer vibe and this skirt and handbag by Tailor & Stylist shows the trend well. i love the skirt because it is a fitted pencil skit (profesh!) with a cute bow accent in the back (fun!). it's sort of like the saying for mullets - business in the front party in the back. that same idea could be applied to this skirt. to keep it more on the casual fun side, i paired it with my new baseball fit jacket from Maison Scotch. this jacket is colorful, lightweight and a great summer addition. of course Tman's first reaction was: 'Are we headed to an 80's party?'. no, Tman, we are not. however, the 80's trend is here so we might as well embrace it! 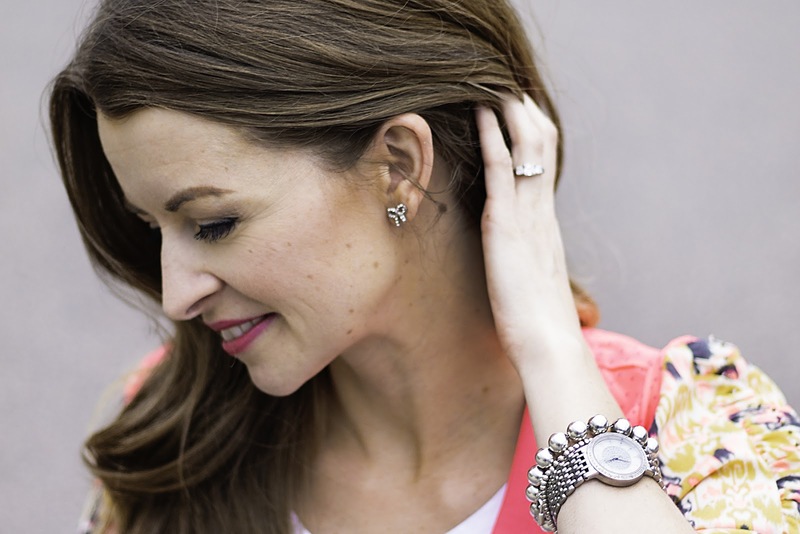 the jeweled bow earrings have been an item i have coveted for years. ever since i saw my sixteen year-old niece rockin' a pair on summer vacation 5 years ago they have been on my wishlist. thankfully, i spotted these sweethearts on the www.TandS.com website and was able to add them to the ensemble. overall i loved my experience shopping with Tailor & Stylist and have loved the pieces i was allowed to try. to check out the rest of their lineup, be sure to visit www.TandS.com. I love this! The colors are great and that top is too cute! Super cute! I love all your fashion posts lately!